Ngurratjuta Iltja Ntjarra; Many Hands Art Centre is situated in the township of Alice Springs and has been established to provide a place for Arrente artists to come together to paint, share and learn new techniques and ideas. Although Ngurratjuta (Many Hands) Art Centre is situated in Alice Springs, its roots are in Hermannsburg. Ngurratjuta has been operational since August 2003 and is funded by the Ngurratjuta Aboriginal Corporation, to preserve the 'Hermannsburg school of Art' including the works of Albert Namatjira and his descendants. 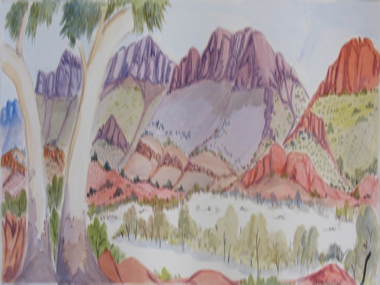 Living in the Alice Springs area are many water colour artists and traditional dot painters. The art centres aim is to create not only a place where artists can gather and socialize but also pass on cultural knowledge with an emphasis on encouraging young artists to explore their talent. Marilyn Armstrong who is one of our prominent artists and also a Ngurratjuta board member says of the art centre: "It's a place where we can sit and talk together about the dream time and learn from each other". Albert Namatijira is one of Australia's most revered and respected artists. 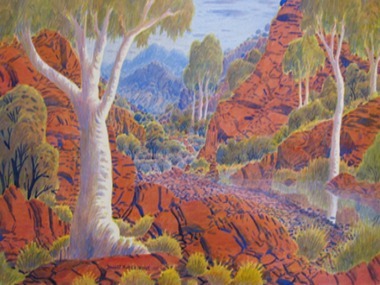 Born in 1902, Namatjira was fundamental in establishing the Hermannsburg School of Art, which emerged during the 1930's. Works of this school are characterised by soft hues, usually watercolour, which depict Arrente country in a typically 'European' aesthetic. 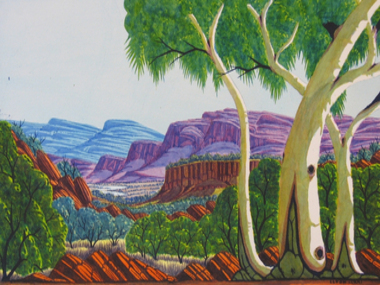 Many of the current artists from Ngurratjuta have carried on this tradition and continue to honour the late Namatjira. Recently, Albert Namatjira's work has undergone considerable evaluation and he is widely regarded as perhaps the most influential and famous Aboriginal artist both nationally and internationally.